Shore side dock makes it easy to launch and retrieve your boat. Can it be this easy to go boating? The shore dock allows you to launch your boat by pushing a button on a remote control while you sit in the boat. You don’t need strength; the boat just moves on a tray along rails between water and dry land. The solution is also gentle on the bottom of a boat, which is not under any strain or rubbing. You can enter your boat easily and safely using stairs while keeping your feet dry. The stairs and its handrail also make it easier for children and persons with reduced mobility to enter a boat. Furthermore, loading the boat using stairs is easy. The shore dock allows you to easily land your boat even in windy conditions. 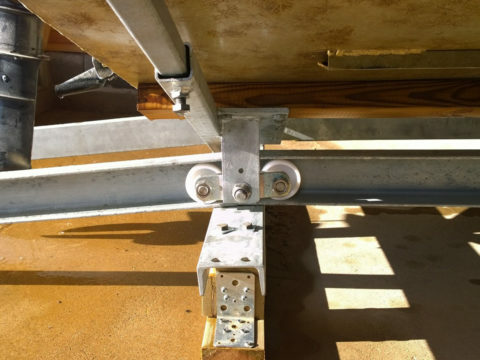 The side guides guide the boat to the center of the dock even under challenging conditions, for example when there is a side wind or when boating alone. To fasten the boat, all you need to do is place a rubber loop from the stairs to the boat. There is no awkward reaching or stretching over or across the bow! The rails of the EasyBoatRoller dock are always designed to fit the shape of the shore, which means it can be in the same place when the water is low and high. You can forget about laborious moves of the boat dock throughout the summer. A patent has been granted for the product in many countries. EasyBoatRoller boat docks are manufactured in Finland. I started by buying an EasyBoatRoller for a smaller, approx. 4.5-metre-long boat. Since then, the device has been developed in cooperation for a larger boat. At the moment, I have a Minor 21 WRS boat, which weighs approx. 1,300 kg. With good support, the dock works well throughout the summer, and it is excellent during the winter for boat storage. The solar panel charges the battery and the remote control always works. 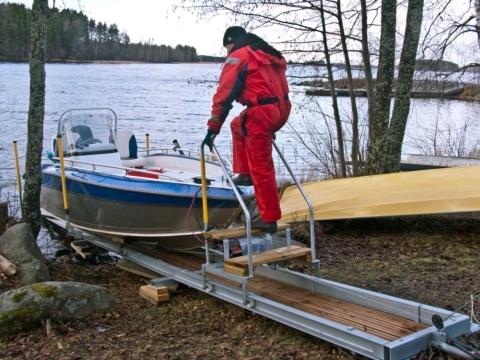 At sea, challenges include steep shores and high wind conditions, which may set requirements, but now the Roller works well for this purpose, and you can sleep in peace at Porvoo’s outer sea, as you know the boat is safely on the roller on land. Enter your boat safely with dry feet using stairs. The stairs are included in all standard models of EasyBoatRoller boat docks. The wheel mechanisms of the tray in EasyBoatRoller roll inside of the rails, not on top. That’s why the tray can never fall off the rails under any circumstances. 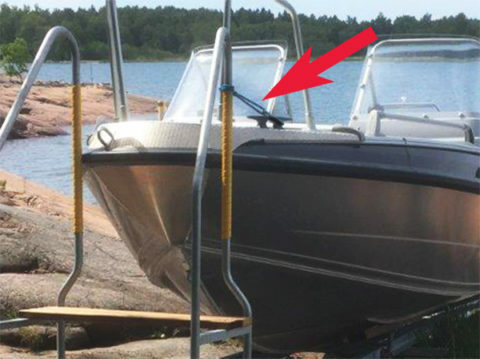 It is extremely easy to attach your boat to the bow step that moves with the tray – there is no need for chains or ropes. Are you interested, contact us!